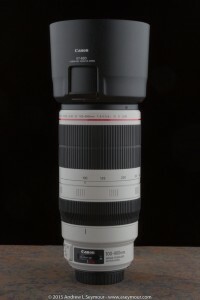 My Canon EF 100-400mm f/4.5-5.6L IS II USM for Insurance purposes. On March 20, I purchased the new Canon EF 100-400mm f/4.5-5.6L IS II USM lens. I did a great deal of research be the purchase, and sweated how I was going to pay for much a lens. Four monthly later, I thought I would add my thoughts into the mix. But at the same time there are points that are valid, and I will add to them in this post. As one of the commentators suggested, I was mocking the cost of the lens, which was out of the price range of most buyers. I agree, this lens, on a pure cost alone, is well beyond most camera owner’s budgets, but as I pointed out, I have owned Canon for nearly 40 years (film and digital); it was part of a ‘mid-life crisis’ purchase and my first L-series lens. I had ‘earned’ it, damn it! Continuing, I said that I also opening a new insurance rider with this particular lens in mind, which adds to the cost. As mentioned, I have been using and collecting cameras for over 40 years, starting with my first camera, a Canonet from the early 1960s. At this point, I have six camera bodies and over a dozen different lens, filters, tripods, etc., so I was more than a little surprised when putting an insurance list together, to see how much I have invested over the years, with the 100-400mm being the single biggest line item. I did NOT take the lens out of the box until I notified my insurance company! I have several 58mm and 72mm glass filters, but the 100-400mm being 77mm. I needed to buy at least a Circular Polarizer Filter, and again in reading reviews, as some stated, ‘if you are going to spend this much money, are you really going to put cheap glass in front’, plus the lens hood is special designed with this type of filter in mind! I will also have to upgrade my square 85mm filters to 100mm, but I should have invested in a 100mm system to begin with. My bad. As I started to review my first images in Adobe Lightroom, using the 100-400mm on my T5i (700D), I did notice ‘things’ did appear to be crisper, and the first image I pulled up, I did say ‘Holy Sh1t!”, but since then, not in all cases. I’ve shot in direct over-head sun, 1/1000+ at f8+ where it should be sharp, but found some softness, and other times, and I’ve gotten down to 1/30 full open aperture, and razor crisp – all hand-held! With some of the close-up testing that I’ve done, I am seeing some fraying on some edges, that does not appear to be chromatic aberrations that I am accustomed to seeing. I am getting the distinct feeling that the sensor (APS-C) is having problems with the resolution detail. I will not really see the beauty of this lens without a serious upgrade to a full frame sensor camera body, or put another way, future purchase, future cost. Point 3 for my Amazon Review Subject hypothesis. Now that I have used the 100-400mm on my T5i (700D) for the past 4 plus months, I wanted to do a follow-up Review, and change the Amazon Review from a 1 Star rating. In my original commentary on Amazon, I talked about the Auto-Focus (AF) being very fast, but I have also noticed that in fast close-up situations, it can fail very quickly while trying to track/pan with the subject, small insects in my case, carpenter bees. During the early spring, they fight/protect their nests at high-speed dive bombing attacks, so trying to focus quickly can be difficult at best. Okay, just switch to manual focus, and focus across on the plane. No problem, for a shot or two. For me, the problem is the placement of the Focusing ring, it is the inner most ring, right next to the body. I have big hands and fingers, so while I am trying to focus, I can not easily steady the lens, the balance is off. Not that it is going to make any difference, but I would have preferred the Focusing ring closer to the front of the lens to help with stability, with the Zoom ring in the middle and the Zoom touch adjustment ring in the rear. By the way, I’m not a big fan of the Zoom touch adjustment ring. Seems like too much real estate on the barrel for too little function, for me. I shot event photography, and the range on the 100-400mm is great! But at the same time, it attracts attention. I don’t mind, occasionally chatting with folks at an event, but how many times do you really want to hear “That is a big lens!” or “I have Lens Envy”. The easiest answer is Yes, if you can afford it. As I have hopefully illustrated, there can be more expenditures beyond the base price, and depending on how you have purchased your older equipment, the amount will be a variable. 1) I should have had insurance earlier. Thankfully, in 35+ years, I have only ‘killed’ one camera (Canon A-1 (film)) and one Lens (70-300mm f4-5.6). I’ve been VERY lucky! Looking into the future, I can’t wait to pay off this puppy and get a new camera body! Would I buy this lens again? I LOVE the one I got!